Back in September 2012, my body was NOT in tip-top shape. I was fine, but the unhealthy lifestyle that I had from working at the office (mostly overtime) took its toll on me. I felt generally awful everyday, and I was always so stressed. I wasn’t one to obsess over weight or whatnot, but after I resigned from my job, I knew I had to start minding what I eat, even more than how I used to. 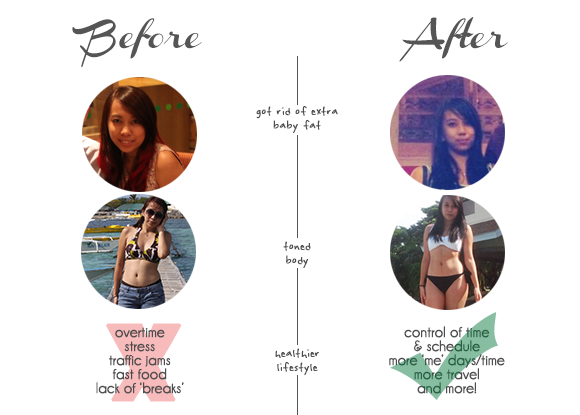 So when I resigned from the bank and started to work at home (this was April 2013), I acquired a lot of time in my hands and I knew that it was the perfect opportunity to start minding how I treat my body. I may be in my early 20s but I know that if I do things right, as early as now, the benefits over the years will be phenomenal. The Facts First Let’s talk about numbers. I used to weigh 58 kilos, now: I only weigh 53 kilos. …Not much, right? It will definitely NOT impress you if you’re expecting some sort of life-changing bodily deduction on my part, haha! But guess, what: like I said, I didn’t care about weight. Besides, I knew from the beginning that having a weight around the 50s scale was already fine for my body especially that I have a height of around 5’4. So clearly: I wasn’t overweight and wasn’t even on the brink of it. But what I just wanted was to tone my body, to get rid of the flabs (extra fat), and to generally feel better: mentally and physically. And right now, I’m glad to say that I’m there! So first things first: know the ideal weight for your physical feature. If you’re not overweight, the habits below will help you shave off some pounds/kilos, just like me. But if you are overweight, they will still help you too! The only difference is that you’ll shed more weight numbers compared to the non-overweights. So yeah, how can you start…? Maintain a good diet I recommend a ‘Half Paleo’ Diet! Now, I hate counting calories. I hate having to stick with veeeeery strict restrictions. (What? You tell me to eat chicken breasts every day? Or some sort of extinct meat breed? And with no spices on it? OH GOOD LORD.) I even hate those diets that make you drink just juices for a meal. Ugh. So! If you share the same sentiments, you’ll love my ‘Half Paleo’ Diet! I say ‘Half Paleo’ because it takes in some points from the official Paleo Diet. There have been a lot of controversies about Paleo and I’ve read them all. The ‘ANTI’ side has its points yet the ‘PRO’ side has its points too. For me, it was a stalemate. So I thought: why not meet half-way? I do not support binge diets, and I personally think that going ‘Half Paleo’ won’t really push you into a binge because it is still almost similar to what you normally consume, but of course: with only a few modifications. How to do ‘Half Paleo’? Try to avoid processed food for as much as possible. Try to avoid eating too much grains. Yes. BREAD. And RICE. And I know, OMG RICE! Haha! Asians as we are, this is hard to let go. I still take it in from time to time though. Of course. But what I just do is try to limit it because these are one of the things that our body still finds hard to digest, just like the first bullet above. Other alternatives then? Well, I’ve started to like eating sweet potatoes a whole lot more (NOT potatoes) or salads when pairing my ‘viands’. It usually just has the same ‘filling’ effect anyways in the long run. And besides, it’s not like we can only get carbohydrates from bread/rice alone; we can also get it from vegetables, nuts, lean meats, etc. Try to avoid sweets and anything related to that word (you know it!) for as much as possible. I love baking, I looooove sweets! Everybody loves sweets! So I really can’t completely ZERO out the sweets from my system. But! Just try to limit it. And I swear to you, if you just start following these simple advises/food tips that I say… over time, you will feel that your body will not crave for such sweet things as often as you did before. Which is great! This factor was one of the AMAZING things that I noticed when I started a ‘Half Paleo’ diet. Take on as much meat, fruits, nuts, and vegetables that you can everyday. The Paleo diet tries to push for food that our ‘caveman ancestors’ eat, but I want to be practical. Like come on, you really can’t mimic their lives then. Example #1: we need spices, our cavemen people clearly didn’t have that, but we still need it for cooking. Example #2: grass-fed meat isn’t always suited for anyone’s budget. (It’s crazy expensive!) So all in all: any fresh meat, fruits, nuts, and vegetables will do you good. Try to incorporate a healthy balance of these things in the meals that you have. I usually take recipes from this site, and as you can see, the recipes there are still almost similar to what you usually intake anyways, but just with a healthier balance/alternative. If you have made it to this part, I hope you got the gist of it that mainly, in the ‘Half Paleo’ Diet, it’s just about trying to eat whole food, and NOT processed food for as much as you could. Start your new lifestyle with that in mind, and over time, you will start to feel that you don’t need to have much of those processed food since your body will gradually highlight the ‘effects’ of such ‘bad food’ to you. One sample experience: after trying a ‘Half Paleo’ Diet for a month, I decided to reward myself with a McDonald’s burger and fries one night, especially since I felt lazy to cook. Hehe. When I finished my meal, guess what? I was happy that I got to taste that familiar taste again. But above all: I felt awful. An especially awful kind of ‘full’. It made me realize that I surely felt ‘full’ before with my ‘Half Paleo’ dishes, but never an ‘awful-feeling’ as this one that I got from eating fatty, unhealthy food. I know it’s hard to stay away from junk food if you have been so ‘accustomed’ to it but you can definitely make baby steps. Let’s say you have cravings of fries, always try to share it with someone so you don’t have to consume so much; or sometimes, cook your own fries but in a healthier version: sweet potato fries! Also, of course, if you could, try to cook your own food and try as much to avoid ordering from restaurants; because in this way, you get to limit the spices and whatnot that you put into your dish. Exercise for as much as you could! I try to exercise 5 times a week, 1 hour per day! Please don’t throw MORE rocks at me. It’s another ‘common’ advice, but I guess by now, you get the idea that there’s reaaally NO BIG SECRET to being healthy. It’s all the same common advice that we get. We just have to try following it and have the guts to stay focused. And about exercise AND diet… they’re a deadly combo. One cannot really ‘live’ apart from the other because they need to be done together to really reap the benefits. Let’s take an example… let’s say you lost weight through a Half Paleo Diet, but if you look at your frame, something looks/feels wrong. One possibility is that your skin looks ‘sagged’ in a way. That’s a bit of a horror, that’s why you need to exercise to keep your body toned whenever you try to loose weight. And besides, generally, exercise is something that is advised for everyone because it really helps our body. For me, it really doesn’t matter what kind of exercise you’re doing as long as you stay active. But of course, unless you’re someone who has a specific goal like gaining more muscles, then definitely, you’ll have to stick to a certain program, lifting weights, etc. Banish the use of elevators. Use the stairs; and if you’re going up, best to take 2 two steps at a time, because skipping a step will force your leg and buttocks muscles to extend. Look for ways to cycle or walk more. If you’re commuting, try to stop blocks away from your destination, and walk from that point to your office/school. If you’re talking to someone on the phone, try to talk to them, walking. Or take enough breaks to get off your seat and walk around; this will help your blood circulate more. If you have a dog, offer to walk them instead of your helper. A 15-minute walk is already a good exercise. Slip in simple exercises during your free time or even during your work time. If you’re watching TV, you can do leg raises (recommend this instead of sit-ups since it doesn’t strain the spine much), or do push-ups during commercial breaks. There’s a lot more you can do, but it’s up to you to decide what exercise is best for you. If you really hate jogging, then surely don’t push yourself into doing such; find another activity, say dancing or playing tennis. And then once you decide on what kind of ‘program’ you’ll be doing weekly, take it slow and commit to it. Make exercise a priority, and within weeks it will develop into a habit that you really won’t have to put so much effort into remembering. It also works if you strictly set a particular time in a day for exercise, and if you also try to make the activity ‘social’, like surrounding yourself with people who have the same goals too. It’s simply all about YOU. If you really want to make a change, you have want it. And then you’ll have to stick to it at first, and eventually, it will become a part of your daily routine. Develop Healthy Life Habits All in all: have healthy life habits, physically and mentally. It’s all about actively making changes in areas of your life that need it. This one can take some time and guts, but generally, let’s say you hate your job, you never have time for yourself, it stresses you out. Or okay, it might be the career you wanted, but it’s not taking you anywhere, or it only makes you feel bad about yourself and everything else. Nothing will surely come out of this, and the sooner that you realize that you should leave, then leave. Find another thing/place that interests you more and that will make you feel better about your life. It’s all about acknowledging that there’s something wrong (about your work, your partner, your friend, your ‘thinking’, etc.) and making it a point to put a change to it, to leave, or to say no… once and for all. It’s all about learning when it’s enough, and knowing that this is YOUR life. Your one and only life. You don’t need to satisfy anybody, all you need is to satisfy yourself. So yeah, I hope I got to help you guys out! Drop me a comment below if you feel the need to add more or correct some things. I’d love for a healthy discussion to go on! What healthy habits are you trying to maintain? Wow! So proud of you for being and staying fit. <3 I highly doubt I could follow all those rules, haha. I'll take note of your tips though. Thank you! Hello Aileen! Thanks for these tips. Staying fit would be my 2014 goal and I might just consider your list. Thanks for sharing. Hey Aileen!! Great post. It's all about developing and maintaining good clean habits both from an eating standpoint as well as exercise. You look great! Hi there! Thank you so much, I really appreciate it. :) And of course, I totally agree with you! It's also all about the mindset. Again, thanks!